When you walk through the doors of The Lamplighter Flower shop, you take a step back in time. The historic building was built in the late 1800's. For nearly 100 years it was a General Store, Grocery and Clothing Store serving Michigan's oldest Charter Township. 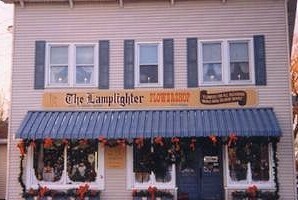 The Lamplighter Flowershop opened its doors May 1, 1974 and it has maintained the quaint charm of its historic building. Dale and Debbie Meyer, owners, along with family members and close friends have served the Bridgeport and surrounding communities with the most up-to-date service in the area for over 43 years. Visit in person or by phone and be greeted by one of the Lamplighter's many qualified employees who will meet all your floral needs. Proudly serving the Bridgeport, Michigan area, we're a full-service local florist that is family-owned and operated. We hope you enjoy your online shopping experience with secure 24-hour ordering right at your fingertips. If preferred, you may call us to place orders direct at 989-777-4200 or 1-800-930-2626. When You Need Something Special, Like Beautiful Wedding Bouquets... Fresh Flowers to Express Sympathy... or Wonderfully Unique Gifts for Any Occasion... THE LAMPLIGHTER FLOWER SHOP Has It All! * Order your Wedding Flowers and Party Flowers from THE LAMPLIGHTER FLOWER SHOP. We will ensure your special day is a blooming success!! Call us in advance at 989-777-4200 or 1-800-930-2626 to set up an appointment for a consultation. Call or visit us today… we look forward to meeting you! Thank you for visiting our website for flowers delivered fresh from a local Bridgeport, MI florist and easy online ordering available 24 hours a day.